The first big announcement to come at Nokia and Microsoft joint event is the Nokia Lumia 920. As it turned out the recently released teasers were spot on, and this is in fact the first Lumia PureView smartphone. The Nokia Lumia 920 looks much like the Lumia 900, but comes with a bigger 4.5" 720p PureMotionHD+ (that's ClearBlack on stereoids) display, with curved glass on top of it. It is powered by the Snapdragon S4 chipset with a 1.5GHz dual-core Krait processor and Adreno 225 GPU. The display is something Nokia is really proud. It’s called PureMotion HD+ and its screen color and brightness will adjusts automatically, depending on the ambient light. If you’ve hoped for an AMOLED screen though, you’ll be disappointed. Lumia 920 camera comes with the PureView branding, but it packs an 8 megapixel sensor at its heart. It offers a cool new image stabilization that Nokia calls "floating lens" and according to its manufacturer is more effective than the optical image stabilization on many dedicated digicams. Carl Zeiss optics, 1080p video recording and an LED flash complete the list of the camera features. The rest of the specs include NFC and LTE connectivity, 32GB internal memory plus 7GB SkyDrive cloud storage and 1GB RAM. The Lumia 920 weighs 185 grams, supports only micro-SIM cards and lacks a memory expansion slot. Nokia Lumia 920 runs on the latest Windows Phone 8 OS and will come with various new services such as Nokia City Lens (augmented really app, which lets you find nearby cafes, restaurants etc. ), refreshed Nokia Drive and Maps, updated hubs and system apps, etc. The last feature worth mentioning is the built-in wireless charging. It uses the Qi standard and will be compatible with future accessories. The first supported wireless charging tool is the Fatboy wireless charging pillow. We hope it comes included in the retail package, but that is yet to be confired. Nokia also teamed up with Virgin Atlantic and Coffee Bean & Tea Leaf to put wireless charging stations so you can charge your Lumia 920 even when you are out for a coffee. 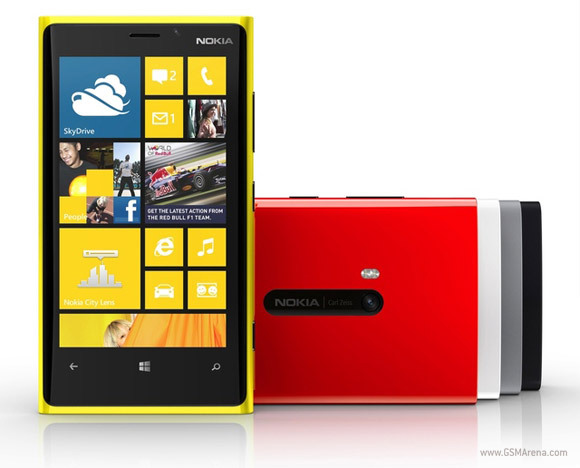 The Lumia 920 will launch in glossy white, yellow and black colors. The pricing and availability is yet to be announced. Windows 8 is a frkn PC os not mobile NOob...And it aint ready yet. nokia pls use android....because i want nokia to be the first....pls pls. Well nobody wants LAGPHONE...Oh yeah..even has a better ring to it. LOL!